I have a scheme in mind: temporarily mark alternative lines through some selected rock gardens to provide fresh challenges to riders who are bored with riding through them the same way all the time. I’m calling them ‘sections’ since that’s the term most often used in mototrials events. I’ve marked these photos with a red line to indicate an example of a short alternative line (viewed from the start and looking backwards from the finish) through a rock garden at Lebanon Hills. I started thinking about this when I went rocking climbing a couple weeks ago at Vertical Endeavors with one of my sons. He told me that they change some of the color-coded climbs each month in order to keep things interesting for the advanced regulars. My inclination is to experiment first using small colored flags to mark the start and finish of a section and railroad chalk to mark the approximate line through the rocks. I want to avoid doing anything that would bother land managers, make things more difficult for dirt bosses/trail workers, or make riding needlessly more dangerous (e.g. stakes or other markers that could impale a tire or body part). The sections would be publicized with photos and/or video in the MORC forum as well as via Twitter and Facebook. Riders would be invited to discuss the sections, brag about their successes, whine about their failures, share photos and videos, etc. And then a month or two later, the sections would be changed to something else. Others could volunteer to set them up. 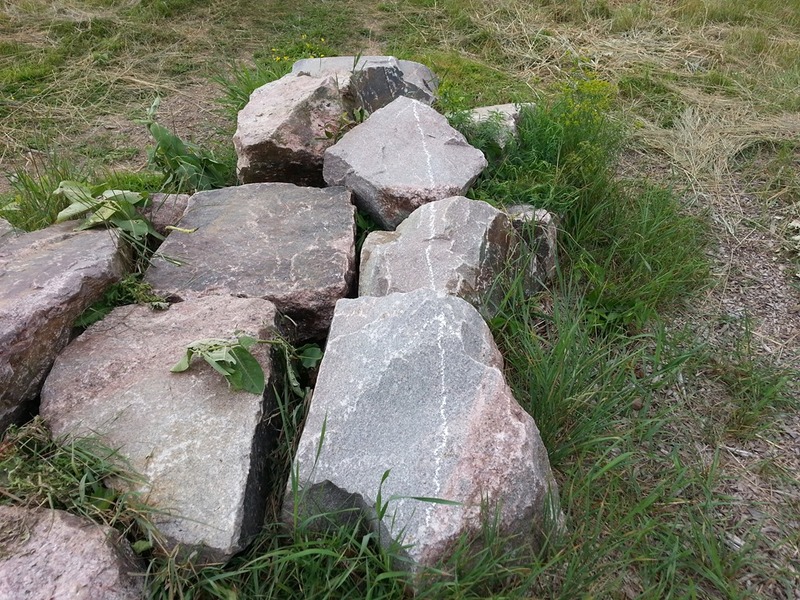 If this works with rock gardens, then it might be worth trying with other technical obstacles. To explain a section to riders who discover it while out riding the trail, we could print a photo or two showing the alternative line, laminate them and tack them up on a stake or nearby tree with a little sign that says “Try this!” We could also put up a QR code near the entrance of a section and link it to a web page with photos and videos. Riders with smartphones could then see what it’s all about. 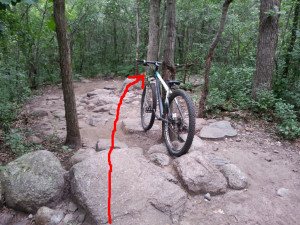 I ran this idea past some of the Lebanon Hills Dirt Bosses last week and they seemed to like it. So I plan to start the experiment there. What might the pros and cons of this idea be, especially the possible unintended consequences? Want to help? Attach a comment. I take it your chalk marks were the ones I saw out there Friday? They were a bit distracting as I was riding through one area but the lines you marked made more sense in a few areas. Frank, yep, I had two sections marked by last Friday. I added four more yesterday. I’ll have a blog post about it all soon. 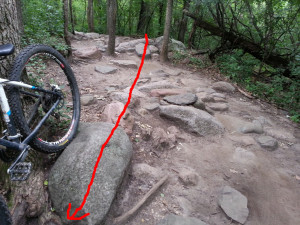 The lines are all meant to be more difficult than the common (easiest) routes through the rock gardens. Ok, I should have figured you would do something like that. I guess I can’t remember which of the 2 it was, but one of them it seems you chose the obviously less traveled route, which to me in the past always appeared to be more difficult, so I took it and blew threw it without any problems. I think if I knew what I was looking for ahead of time so I am expecting it before I get there I would be able to check it out and try it more easily. Let’s continue the discussion there.